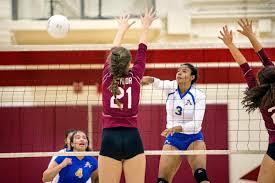 Many volleyball teams began league play last week. Flintridge Sacred Academy remains the top-ranked team in the weekly San Gabriel Valley Newspaper’s poll, sweeping Alemany and Harvard-Westlake in Mission League matches. Glendora moves up one more position. Arcadia and Gabrielino move into the Top 5. This entry was posted in Uncategorized by klair. Bookmark the permalink.